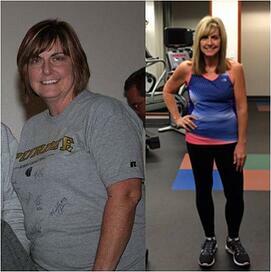 Sherri Pryor came to me in our corporate fitness center after starting this journey on her own. She was determined to continue to make positive changes in her life. She was definitely apprehensive about talking to me at first. However, she has overcome her own insecurities to become a stronger and more confident version of herself than the woman that first came to me three years ago. There have been goals set, goals achieved, and goals missed, but through it all she has always kept a positive attitude. This attitude has helped her become the best version of herself she can be. Here is her story! I started this process in early 2012; I was committed more than I had ever been in my life to making changes, exercising more and improving my personal wellness. I was tired of feeling like I had no control over how I felt and looked. There are so many things in life that we truly can’t control. Making time for exercise and doing things to improve your overall health are not on that list. It was hard at first; but it got easier with time. Two things were always in my head: 1) It’s hard! It takes time and effort and my plate was full with a family and a full-time job. I was convinced I couldn’t fit it in and still get everything else done, 2) I can’t stick to both exercising AND making better food choices. I had always been able to be successful at one or the other but only for a limited amount of time. One step at a time worked for me… I started making better food choices. I lost a few pounds and started feeling better. Sixty days later, I started going to the gym. And finally…I asked for help. Working with a personal trainer made such a difference. I learned so much about how to maximize the time I spend there. I felt accountable because he was putting in the time to help me every week, but I did not feel pressured. I’ve experienced one set-back along the way; but instead of giving in to the negative feelings that came with that I tapped into the positive feelings I had become familiar with to that point. I kept going to the gym. I kept hitting the salad bar at lunch, even if I had had a chocolate chip cookie the night before. In the beginning, it was about losing weight more than anything. Today, I consider success making exercise part of my life; not just a means to an end, like losing weight or training for an event. Those things are awesome and have definitely played a part along the way for me. But it’s how it has improved the quality of my life. I would say the same for wellness. Success comes when the changes you make become part of your life/lifestyle. They stay with you. I enjoy exercising now and I WANT it to be part of my life; the same with wellness in general. I want to feel healthy and energetic. And those things have come because of the changes I made starting in 2012. 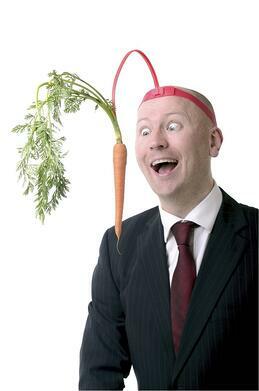 Interested in helping your employees reach their goals in regard to living a healthier lifestyle. 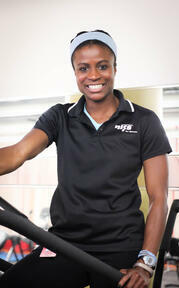 Checkout our webinar series and learn how you could have a successful corporate fitness center. In 2014, Laura Zavadil, one of our registered dietitians wrote a blog about her work with a corporate fitness client who had a bad experience with AdvoCare® products. This blog has generated a lot of feedback, conversation, and comments. We want the readers to hear where she was coming from in sharing her opinion on the blog. We appreciate all the feedback and want to encourage positive dialog and sharing of opinions. Thank you for reading. Check out this blog in regard to what's in your diet. We kicked of the new year with tackling the components of a workout. Flexibility is often overlooked, but is needed in everyday activities. Not stretching properly or a sedentary lifestyle can negatively affect one’s flexibility and range of motion. Without appropriate stretching and activity, our bodies’ posture and movement patterns can change overtime reducing range of motion. There are two kinds of stretching: dynamic and static. Dynamic stretching uses controlled movements that bring muscles through their full range of motion. Static stretching involves taking joints through a range of motion to a comfortable end point, holding that position for a period of time (at least 10 seconds). Self-myofascial release, commonly used with a foam roller, is another method to increase flexibility. In this technique, one uses a foam roller to assist in self-massage to release muscle tightness or knots. Foam rollers are available in different densities. At the beginning, the process may be uncomfortable. A softer roller is ideal to start with. Foam rollers are available for purchase online or in any store that provides basic to advanced fitness equipment. For dynamic stretches, check out our blog about warming up which includes dynamic stretching. Get our Free Workout Friday blogs and other great content directly to you inbox by subscribing to our blog! It's important to fit exercise into your daily routine and both cardiovascular and strength training are recommended by the CDC to be incorporated weekly. One hundred fifty minutes of moderate aerobic activity is recommended for cardiovascular training. To strengthen and ton your muscles, strength training should be done at least twice each week and include all major muscle groups (legs, hips, back, abs, chest, shoulders, and arms). Cardio stresses your heart and lungs making you breathe harder, while strength training focuses on muscle strength, power, and endurance. It’s okay to enjoy one activity more than the other; most people have preferences, but a proper balance between cardiovascular and strength training is what is important. Check out the following suggestions. Pick one or two of the cardio activities, break it up into 15-20 minute bouts. 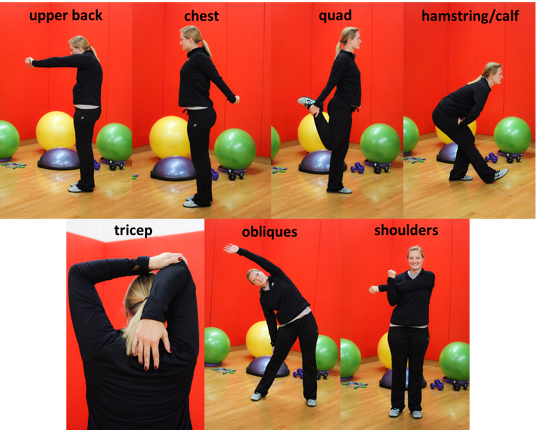 Complete the strength exercises to tone and improve muscular endurance. 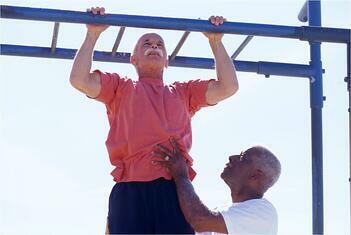 Strive for 12-15 repetitions of each exercise using moderate weight. Subscribe to our blog to receive Free Workout Friday blogs directly to your inbox as well as other great content from NIFS Fitness Management. Last week we talked about the proper way to warm up before exercising. This week lets talk about cooling down post workout. A proper cool down at the end of your workout is just as important as a total body dynamic warm up. Your goal during a cool down is to decrease heart rate and static stretch the muscles. To decrease heart rate, continue with low intensity cardio and reduce pace every minute or two. Marching, light jogging, or walking are great ways to get your heart rate back to its resting level. Static stretching prepares the body for its resting state. Start with some basic stretches. As you feel comfortable, incorporate some compound moves. A new year means new trends to follow! What do you have planned for your workout routine this year? Hopefully, the plan is to either begin or continue your fitness routine, but possibly add more variety into it. Make it your year to become familiar with the endless options and try something new! Wait, body weight training? What happened to lifting heavy? Body weight training is predicted to be the next big thing this year. This includes comprehensive incorporation of gymnastics, adult jungle gyms, uncluttered workout spaces, suspension training options, basic movements, and programming that is not as focused on the standard weight lifting protocols. This means back to the basics with lunges, squats, and push-ups. What are your thoughts? Will the benefits from body weight training be as successful as lifting heavy weights? HIIT, the alternating bursts of exercises with short recovery periods, is a popular trend known for its quick fat blasting tactics. I mean, who wants to spend endless hours at the gym when you can just knock out about 20-30 minutes of HIIT? Trust me, that is plenty of time to get a ‘sweatastic’ workout in and definitely one my personal favorites. You can create quite the variety of workouts, allowing your muscles to always be surprised by what is next. Plus, the variety can keep it interesting and fun so you don’t get burnt out so easily! Treadmill training is poised to be the next “it” workout, according to Health Magazine. I know many are not fans of treadmill workouts and are tempted to consider it torture, but Health Magazine names running as the oldest form of exercise. I, myself, would rather run outside than on a treadmill any day. That tends to become a challenge during the colder months, so I put together treadmill interval and speed variation workouts to keep myself from getting bored of my workout. With this up and coming trend, classes will allow participants to improve their running through speed and interval-based training drills. Participants will also have the chance to become more engaged in their workouts and can avoid the worrisome of how to log miles when it is cold or rainy, since training is indoors. These workouts are meant to push your body’s limits. With the higher chance of being sore, there is a need for recovery - foam rolling, restorative yoga, therapy balls, dynamic stretching, and core strengthening are perfect examples. A good night’s rest is also important for recovery. Allowing for recovery time after an intense workout decreases your chance of overtraining your muscles and the potential for injuries. So, now that you are familiar with the predicted trends, how will you log your intense workouts? We are in a generation that is highly involved with technology - fitness watches and Smartphone apps at our fingertips. Digital engagement keeps us motivated, gives us inspiration, and coaches us through our workouts. Do you have a favorite piece of technology you use to track your workouts? Overall, what do you think about these trends? Are you interested in trying out something new this year?! 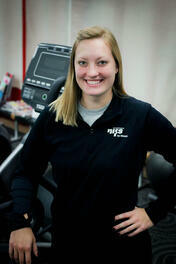 Connect with a health fitness specialist in your corporate fitness center or local gym to get started on a better you. Subscribe to our blog and recieve our Free Workout Friday blogs directly to your inbox!